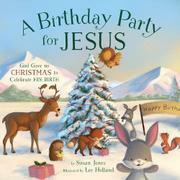 Little Bunny celebrates with his animal friends at a Christmas party celebrating the birth of Jesus. When the young rabbit receives an invitation to a Christmas party, his mother explains that Christmas is Jesus’ birthday. Little Bunny dreams of the presents he likes to receive for his own birthday, such as toys and sweets, and wonders what present he can take to the party as a gift for Jesus. The bunny finds his friends decorating a tree outside and placing wrapped presents under it with tags listing qualities and goals such as kindness, faith, and peace. Little Bunny makes his own package with a tag specifying “Love,” and his mother explains more about the connections between Jesus, Christmas, and the concept of love as “the greatest gift anyone can give on Christmas.” The simple story is told in just a few words, introducing some basic concepts of Christianity in terms accessible to young children. Charming, soft-focus illustrations create a cheery personality for the little rabbit and wintry settings of snow-covered trees and darkening night skies. The final scene shows the group of animal friends gathered together at night, with a glowing star in the sky also serving as the star for the Christmas tree.